In Cambodia, government officials rarely respond to allegations of corruption, which is thought to be widespread at all levels of government. A worldwide movement against “grand corruption” can help boost Cambodia’s own domestic anti-corruption efforts against large-scale graft, a governance specialist has argued. Ok Serei Sopheak, who heads Transparency International Cambodia, appeared on an edition of the “Hello VOA” radio show on Monday, pointing to recent developments in Malaysia, where Prime Minister Najib Razak is under fire for receiving mysterious payments into his personal bank accounts. The public outcry over the current scandal in Malaysia could hold some lessons for Cambodia’s own handling of large-scale corruption, he said. “If this movement takes hold in Cambodia like what I have seen in Malaysia, all the Okhnas [business tycoons] when traveling abroad will have to be transparent and rid themselves of involvement in grand corruption, or else no one will want to do business with them,” Ok Serei Sopheak said. 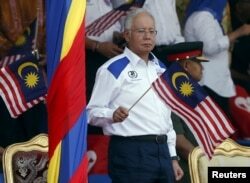 Malaysia's Prime Minister Najib Razak waves a Malaysian national flag during National Day celebrations in Kuala Lumpur, August 31, 2015. A coalition of anti-graft nongovernmental organizations, led by Berlin-based Transparency International, met for a global gathering in Kuala Lumpur last month, shortly after allegations emerged that Prime Minister Najib Razak misappropriated $700 million of state funds. The group’s global network has been leading a worldwide effort to fight large-scale corruption by national elites and business interests, which can be difficult to tackle domestically. Ok Serei Sopheak said that to achieve this goal, the movement was relying upon cooperation between governments and major world institutions like the World Bank and the International Monetary Fund, strengthened global banking networks, stronger international anti-corruption law and investigative powers, and travel restrictions for corrupt officials. “Such cooperation and information sharing is unprecedented,” he said, noting that Transparency International Cambodia, the local chapter of the global network, was already pushing to strengthen asset declaration rules, and calling for a new whistleblower law. Cambodia should be watching the scandal surrounding Najib Razak, he said, adding that the Malaysian prime minister deserved some praise for sending a senior government minister to answer questions at last month’s conference. In Cambodia, government officials rarely respond to allegations of corruption, which is thought to be widespread at all levels of government. Van, a caller from Sihanoukville, asked if there was political will in Cambodia to take advantage of such global efforts, pointing out that the country was struggling even to enforce existing rules that require officials to declare their assets, albeit in secrecy. Ok Serei Sopheak responded by saying that the ruling Cambodian People’s Party’s relatively poor showing at the 2013 elections had already led to some action. The government has taken steps to fight petty corruption by automating tax collection and some administrative procedures, he said. However, he added, the government’s own Anti-Corruption Unit has yet to tackle the “grand corruption” that is tied to longstanding social problems in Cambodia, namely land grabbing, deforestation, human trafficking and economic inequality.